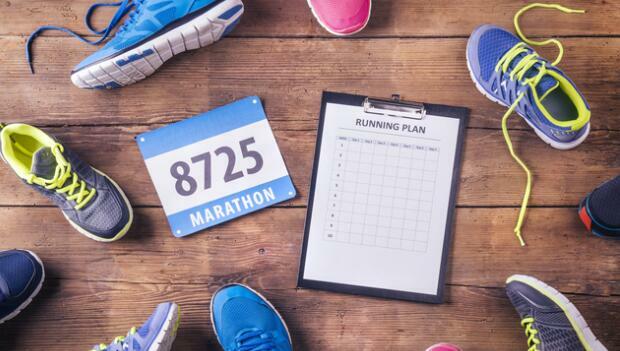 A training schedule for marathon beginners that will provide a balanced plan should look at the two components to long-distance running: cardiovascular fitness and musculoskeletal resilience (your muscle and skeleton's ability to bounce back). As race distance increases, there is a much larger musculoskeletal resilience factor than a cardiovascular fitness component. In other words, if you are going to race short, fast races, you need the ability to get oxygen from the atmosphere to your mitochondria as fast as possible. If you are planning to run all day, you need the ability to tolerate compressive and ground reaction forces on your musculoskeletal system. A marathon fits into a middle ground that challenges both components. While some elite runners are taking their cardiovascular system to the limit for two hours, those of us who take twice as long will likely feel the stress in our joints and muscles by the last six miles. This training program will have three runs per week along with two cross-training days and two rest days. The three running days will consist of a short/fast run, a medium run, and a long run. Choose your days as you like, just make sure that you have a rest day on either side of the long day. Cross-training can be biking, swimming, aerobics class, or hike, with an emphasis on moving in a different way than running. The short-run day will be either a three or four mile run, with an emphasis on cardiovascular stress. Do these on the treadmill so you can adjust your pace and elevation easily. Start with a five-minute warm up at about a 5.5 mph at 0% incline. At the sixth minute, go to 6 mph for the rest of the first 10 minutes. For the remaining 20 minutes, increase the speed a tenth of a mph each minute. By the time you are done with 3 miles, you will be going about 8.0 mph. Obviously, you can adjust your speed if you are faster or slower than me. Another type of short run is a hill run. Start with a five minute 5.5 mph warm up and then go to 6 mph for five minutes. At the 10 minute mark, increase the angle by .5 percent every minute for 10 minutes, then decrease the incline every minute for 10 minutes. At the maximum speed or incline, you should feel like your rate of perceived exertion is at a 9/10. The middle-distance run day can be outside or on a treadmill. The purpose of this run is to bridge the short and long run. You should run at a pace that is comfortable, but not able to have an easy conversation. This run should feel good, and give you confidence about the fact that you are able to run for an hour or more without passing out. You should not need any nutrition, but may want to drink some water when the time exceeds one hour. If you are running on a treadmill at the gym, they typically won't allow you to go beyond an hour. I like to split the run into two sections with a walk to the water fountain in between. This really decreases the mental fatigue of running 8s and 9s on a treadmill.